Anyway, he's back home. We will have to go back down to check the house again once the power comes on. He is on his way home... taking the bus from Brownsville. I'm so relieved. Bus should get in around 7:30 tonight. The latest estimate to get all the power back up on South Padre Island is "7+" days. I don't know if my husband knows that, since I haven't talked to him since 4pm. I doubt I'll hear from him tonight... which is discouraging. If he were hurt or sick the calls would come but right now nothing. So I am left spinning in what-ifs and worries. I must to do 2 things next week - a deposition in Corpus Christi on Monday, and a file review in Chicago on Thursday. My thoughts are to drive down on Saturday, pick him up and do the depo in Corpus on Monday, and then drive him back to Houston. There are other things that should be done (a file review, and visiting my parents) but both of those things can be rescheduled. What-ifs and worries... I'm sure more will be clear tomorrow. And by local I mean our street. My husband reports that our house has very minimal roof damage, a few shingles lost. One side of the privacy fence blew down. A bit of water under the front door. Amazing really. He says the water was back on this morning when he woke up. Our neighbor to the east - the roof has a hole in it (not sure what size or which side). Our neighbor to the west - roof damaged as well, and the fence is down between our yard and his. The neighbor further up the street to the east - more roof damage as well. There was no street flooding on our street or on Gulf Boulevard close to us. Padre Boulevard was definitely flooded. He is going to stay and work with the neighbors on their cleanup. He says he is fine and he does actually sound OK. Hopefully the power will be restored fairly soon so that he’ll have something to eat besides cold tortillas and cheese. The news reports say it will be “several days” before power is back on. Cell phone calls aren't getting out - perhaps the traffic is too heavy this morning. He had to call me from the neighbor's land line. I am hopeful he will take pictures but of course without power it's going to be hard to get them to me! And good riddance, too. She left quite a bit of damage in her wake - we won't know the full story until the rain stops and the wind dies down some. At the peak of the storm my husband said the house was shaking and once in a while he would hear a cracking sound. Hard to know what that really is without further inspection. The power went out around 11:30 this morning, and the water stopped around 3 this afternoon. Hopefully the city crews will be out in force to get the utilities running again. There are quite a few people on the island so that should help. And the causeway should be reopened soon (it has to be closed when the wind exceeds 39mph) now that the wind has calmed down to about 35. Hurricane Dolly is passing over the island now. Overnight the wind and rain were "very noisy" according to my husband. I spoke with him early this morning and again about 20 minutes ago. So far the power has gone out once for just a minute or two. Cell phone still working. He says "it's a good thing we didn't pay anyone to prune the palm trees because they are all pruned now". Looking at the radar it seems the eye will pass right over our house. In a way I wish I was there to see it. Can't get him to take pictures during the storm - he won't open any windows or doors and says that the windows are too fogged/rained on to get anything meaningful through them. hurricane dolly sunset, originally uploaded by AmyEmilia. 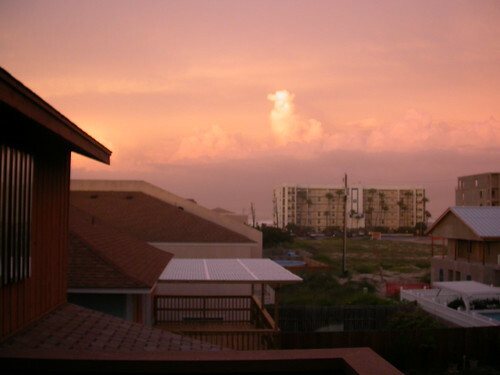 This photo was taken by my husband, who is riding out the storm on South Padre Island. I was talking to him as he was taking these pictures, and all he could do was say "wow!" over and over again. Here in Houston the sunset was pinky orange too, but not quite as nice. As you can see, the surf is quite wild-looking. He is planning on going down to the beach in the morning (after the storm passes of course) and taking a few more pictures. I hope his night isn't too rough. Looks like Brownsville is the target for Dolly. My husband is at our South Padre Island home, and I'm in Houston. Certainly he will have LOTS of rain and wind but since the storm should come ashore as a category 1 hurricane we are not panicking. Maybe he will send photos - if so I'll post. Here in Houston we have already a little rain - desperately needed here and even more further west and south. Forecast winds of 20-30 miles mph here. hot, originally uploaded by AmyEmilia. 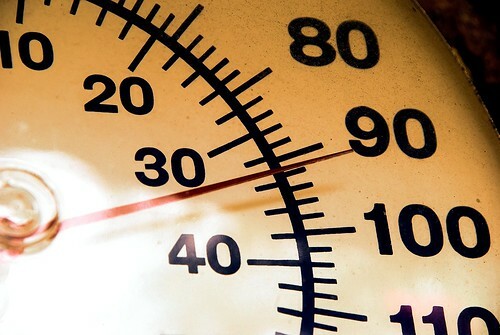 No surprise, it's hot in Houston! I think that is part of why I haven't posted much lately. Too hot to do anything really. As they say - it's not the heat, it's the humidity. Believe it or not, Houston isn't the most humid city. Houston actually is pretty far down the list at 27th. Cities ahead of it include New Orleans, Galveston, and Brownsville. I've also eliminated the following locations from any future intinerary: The Caroline Islands (except for Yap, which I'd like to see for it's famous stone money), Guam, Marshall Islands, American Samoa - and a whole lot of Alaska. Or maybe not. I've visited lots of "uncomfortable" places, and I had a great time at all of them. The weather was a factor and something that I remember - but it was part of the place, part of the experience. Which brings me back to summer in Houston . The real source of my ennui is familiarity. For the last 17 years, every summer has been hot and humid and full of mosquitos. The air is thick and I am reluctant to breathe it in. The air smells wet, the grass grows green. Moss creeps up the bricks, my camera lens fogs when I leave the house. My orchids hang in the live oak tree and bloom like they are in Thailand. It may be hot, and humid - but it is home. sandcastle, originally uploaded by AmyEmilia. My nephew and I built this sandscastle while we were vacationing on the Island (South Padre that is). I am a particular fan of drip castles and this is easily the biggest one I've ever done. We had a fine time! 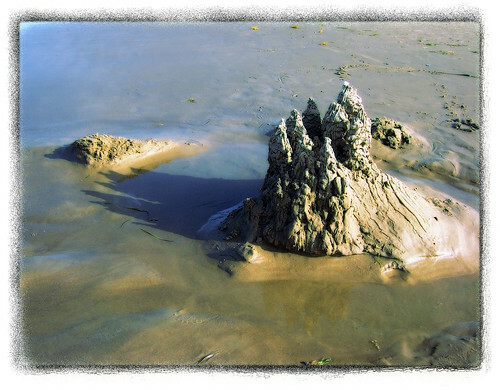 Sandcastle building is a meditative endeavor - the sand running through your fingers, the waves rushing up and down the beach, kids laughing, the sun creating sparkles of light on the wettest parts of the castle. Sometimes a big wave comes in and part of the building collapses. When you leave, the building stays but for a few hours at the most. But I can always visit the drip-towers in my memory, looking out to sea. worshipping the wyland, originally uploaded by AmyEmilia. I know I've been silent for a long time - and this picture tells you a little about where I've been. My sister and her family came to visit us down on South Padre Island - we had a wonderful time. The Island is a great place to just hang out. Not a lot of big sights to see (althoughSchlitterbahn Water Park got high marks) but plenty of space for a family to run and play and eat. 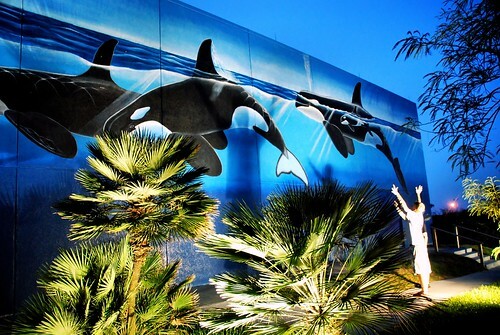 The artist Wyland painted this wall in May 1994. It is part of the South Padre Island Convention Center. The side where we were playing around (the south side) also has an area of native trees and flowers to attract birds and butterflies. The boys had a great time making shadows in the spotlights! My sister and I had not vacationed together since we were children, so this was a special week. I am so glad it was possible!